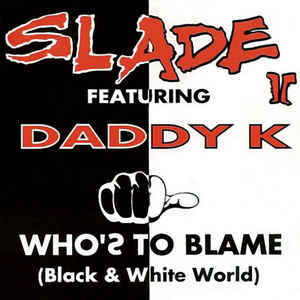 Who's to Blame (Black & White World) is a single from Slade II, released by Columbia in July 1995. A re-working of "Black & White World" from the band's debut studio album Keep on Rockin', "Who's to Blame" features the Belgian rapper Daddy K and was written by Dave Hill, Bill Hunt and Daddy K, and produced by Paul Despidgeleare. In September 1994, Slade II began recording their debut album, Keep on Rockin', in Belgium with producer Paul Despidgeleare. Released in the UK and across Europe in November 1994, "Black & White World" was picked as the album's second single, following the release of "Hot Luv" earlier in March. However, in Belgium and France, a re-worked version of the song, re-titled "Who's to Blame", was released instead, featuring the addition of rapping from Daddy K.
The executive producer of Keep on Rockin', Marc Debouvier, had suggested that Slade II and Daddy K work together. Daddy K was a friend of Debouvier. Daddy K appeared on the song courtesy of Private Life Records and received a co-writing credit. The idea was to produce a recording similar to that of Aerosmith and Run DMC's "Walk This Way". However, like the main "Black & White World" single, this version was also a commercial failure. "Who's to Blame (Black & White World)" was released as a CD single by Columbia in Belgium and France only. The B-side was Slade II's own original version of "Black & White World".